Learn to sort by size and colour with these fun sorting worksheets with a Christmas theme. This must be one of our prettiest match up activities! Can the children match up the pairs of sparkly Christmas baubles? 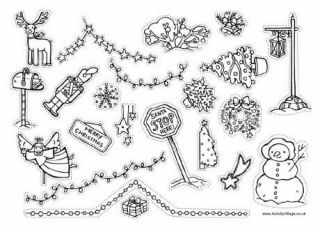 We got two pages of lovely festive pictures to print and cut out - can the children sort them into 'big' and 'small' on the printable mats? You can laminate the pictures and the mats so you can reuse them too. Ho ho ho! There's lots of Christmas sorting fun to be had on this worksheet! Can the children circle the biggest Santa, Reindeer or Present and put a cross on the smallest? The kids will enjoy this colourful Christmas sorting worksheet. Can they match the coloured parcels with the hat colour of each snowman? It's lots of fun guessing what's inside a present based on the size of the box! But can the kids sort these presents into size (smallest to biggest, then biggest to smallest)? The children will love the fun pictures on this Christmas size sorting worksheet, in particular, the cute gingerbread men! Can the children number the pictures in each row from 1 for the smallest to 5 for the biggest? The bigger the stocking, the more gifts that will fit inside! Can the children sort these stockings into size order? Print and cut out these cute penguins (laminate if you wish), then ask the children to order them by size!